In the March 2011 Edition of Hertfordshire Countryside Magazine, I was proud to have a close client of mine kindly write in and have her letter published below. Andrew Chapman is a young cabinet maker based in Hertford who has just set out on his own. He recently made a beautiful letterbox for my grade 2 listed cottage. This outstanding work might encourage other such entrepreneurs. The letter box enters the house through an external wall to a depth of about 12 inches. The flap was often left wedged open by letters if they were not fully pushed through, causing draught and immense loss in heat. An exterior American style mail box would have been out of keeping with the conservation area where the cottage is situated. It was impractical to bore a letter box through the hefty front door and this would have spoilt its appearance. Using lateral thinking, Andrew Chapman sketched out a design for an interior oak collecting box which would harmonize with surroundings. I stipulated an acorn motif on its roof, the husband an oak leaf. Mr Chapman mulled this over in his workshop. 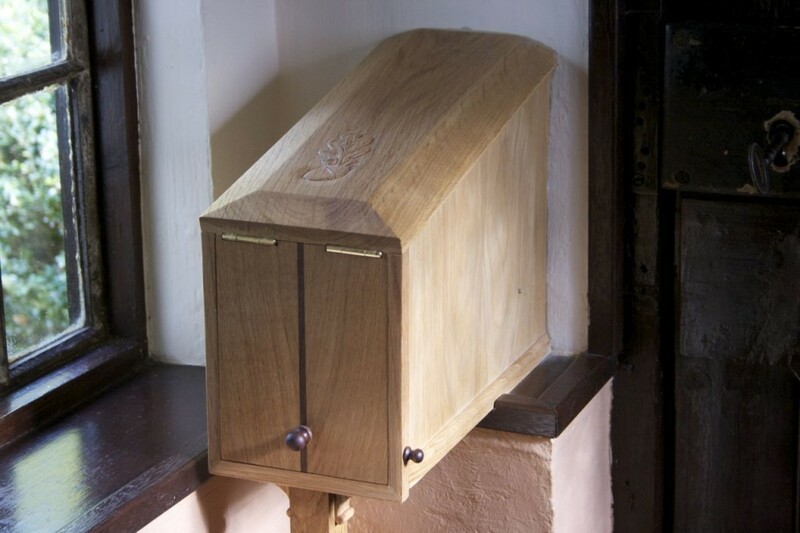 One week later, with masterly compromise, much to my delight, he installed a beautiful oak receptacle, with a hinged door, inlaid with American black walnut, finished with Danish oil and featuring an oak leaf and acorn. he added three small circular shelves as decorative feature. This was fitted to the interior wall, eradicating the draught completely, making it eco-friendly as well as functional and decorative. One can view the result in my picture.